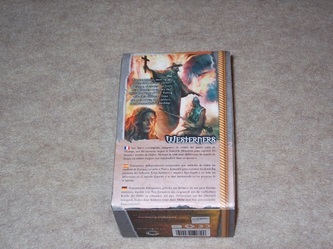 This was once exclusively a French game, which was distributed Asmodee Editions. Cipher Studios here in the US announced picking up the rights to HellDorado late last year, and now the models are slowly starting to resurface here in North America. At Gen Con Cipher Studios unveiled their all new Starter Sets for HellDorado, complete with English basic starter set rules. 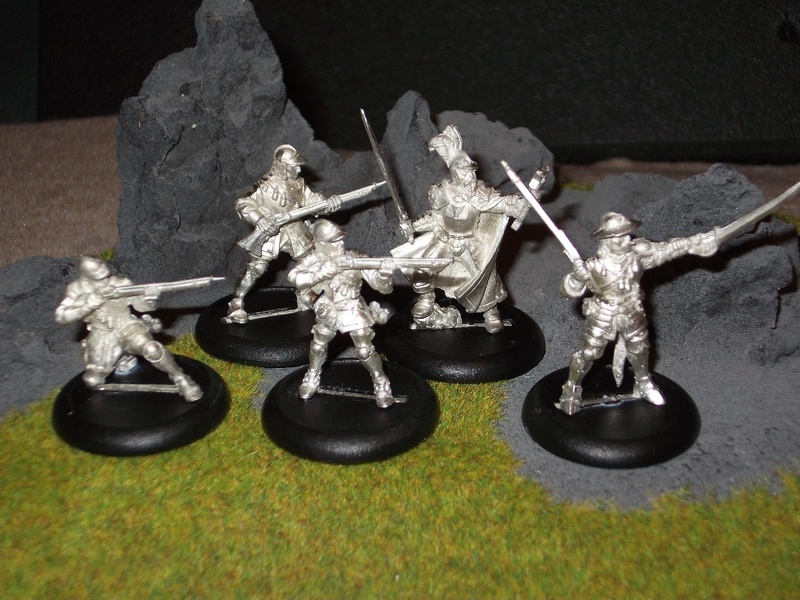 Today I'll introduce you to the Westerners Starter Set for HellDorado from Cipher Studios. Essentially all of these starter sets are repackaged existing models, only re branded under the Cipher Studios name. 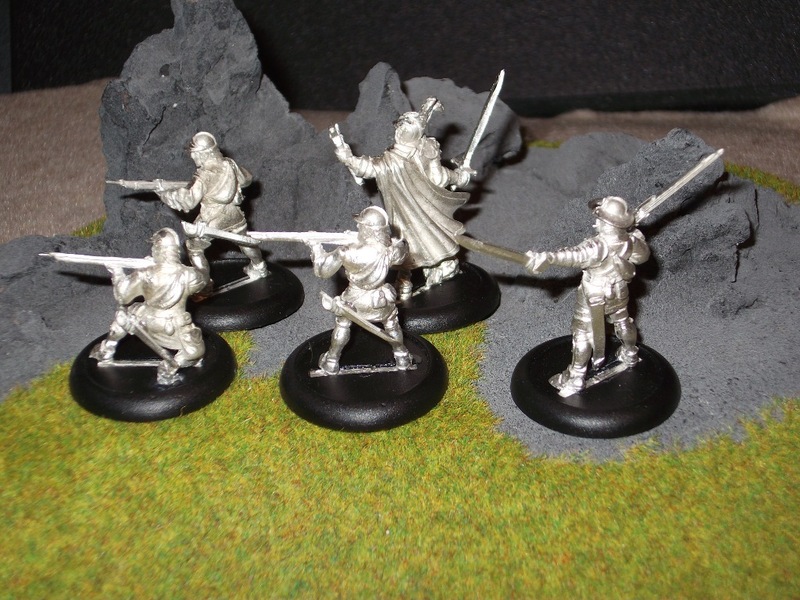 Some of the models may look familiar if you are one of the few North American gamers who purchased the original French versions of the original model castings. The official word on the scale from Cipher Studios is that these are 32mm scale models, since many measure that to the eye. Although as my pictures reveal, they don't look out of scale much at all next to many other popular 28mm and 30mm scale models. The Westerners set comes in a nice small box, complete with a two sided fairly large sheet of starter set rules, and the 5 models that make up this Starter set, along with English full-color printed cards to be used to play with each of the models in the actual game of HellDorado. These are all multiple piece models, some of which come with some very tiny parts. For instance, the rifle held resting on the Sergeant models shoulder fell off 3x times now, and it's too darn small to pin in place. That model has been trying my patience. There's three different Arqubuser models in this set. One is crouched down taking steady aim with his rifle. He was pretty much a single piece model, aside from having to glue his sword/scabbard on to his waist, and then to the included plastic base. The next standing Arqubuser is also taking careful aim standing tall, and he only requires gluing the sword/scabbard in place, and then to his included 30mm round lipped display base. The third Arqubuser is also standing, but he appears to be moving in a forward motion carrying his rifle, more than aiming it. His rifle, with hands sculpted on comes separate, and getting the wrists on the main body to line up perfect with the rifle/hands was a test of my patience to say the least. I eventually I was able to line it up as best I could, but it could have lined up nicer. He too also requires gluing his sword/scabbard to his waist, and then to his base. 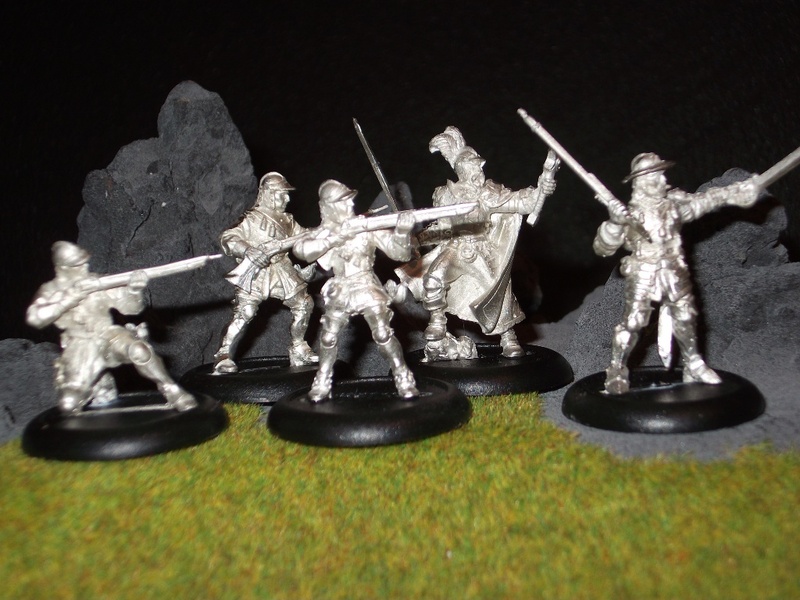 The Aidan Staint James is the sergeant model, and he's comes in 5 pieces, including his base. His left arm outstretched with sword in hand pointing the way ahead, and his rifle resting over his shoulder both require attaching to the main body. The left arm with sword in-hand fit nicely, and stays in place rather well, but that rifle makes me want to scream. As I said earlier, it fell off a number of times already, and it's too small to pin, so I'm hoping for the best, but expecting the worst with this model. Lastly we have the leader of this little band of demon-hunting crusaders, Francisco Vargas. His sword hand stays in place well, and his left hand required gluing in place as well, and all of his parts fit rather nicely. Sculpt-wise he's the most ornate of the models, with quite a bit of detail on his armor, and attire overall. The 2nd most detailed model is probably Mr Saint James, as he's even smoking a cigar, and looks rather battle hardened. The three different Arqubusers are detailed quite nicely too, it's definitely a nice set visually speaking. They all have that Spanish Inquisition look about them, and it's clear that these are the holy rollers sent by the Vatican to rid the world of non-believers of the Christianity. Clean up was also no walk in the park, because there was a lot of mold lines, plus a lot of flash and extra bits of metal to cut away from just about all of the models. There was even little posts present that were no part of the models, which had to be cut away from some. They're nice models, but they'll take a bit of work to get them cleaned up and assembled. Even though these weren't the most tidy models I've ever encountered in terms of clean up and assembly, that doesn't take away from the fact that these are still really impressive models. 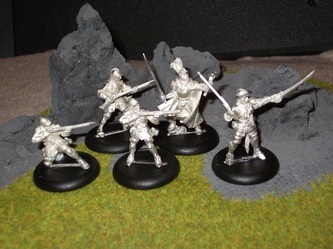 A multinational Demon-hunting force also wouldn't be my first choice personally as a faction, as I'm not a fan of the motif and all, but as models I definitely appreciate how crisp and sharply detailed they are. 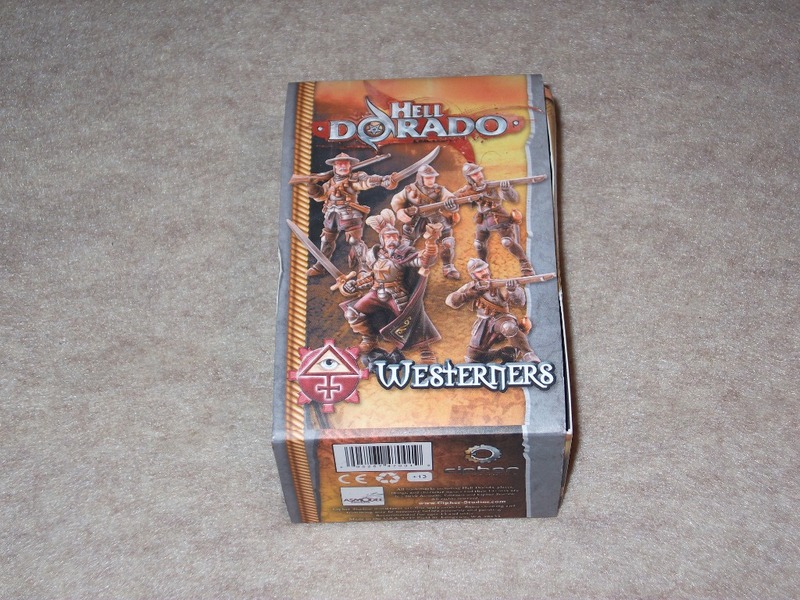 The fact is, even though HellDorado was a French game, it featured models so nice, that many painting enthusiasts were purchasing these models straight from Europe just to paint them up. These are the same models, only now you get English rules in the Starter sets, and English speaking gamers can actually use them in the game now. Here's the other thing too, these Starter sets are only $29.99. At that price they're quite a bargain, especially considering I've seen models equally as nice as these selling for $10+ each, and you're getting five very detailed 30mm scale white metal models, plus starter set rules, and 5x full color stat cards in English all for that price. This set required a little more prep work than most, but I think the end result is worth the effort, and this is just the tip of the iceberg when it comes to HellDorado, because at present Cipher Studios has 5 different faction starters available. There's also a lot more models than what's included in those starters alone available in the original HellDorado product line. Cipher plans to release them all over time under the Cipher Studios brand, plus they're releasing a variety of all new models for HellDorado as well. The new full-blown rulebook in English for HellDorado is still in the works as I write this, and I'm told we might see it as soon as December-ish at this point. 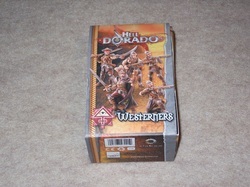 For more on HellDorado stay tuned to WarGameGuru, as I have two other Starter sets to review, and once the rules and future models become available I'll likely cover them as well.